World of Warcraft, also known as WOW, is an incredibly addictive and highly graphical game. There are countless things to do in this game like dancing, being rude to others, getting married, stalking, raiding, fighting, etc. The game can absorb your whole life and continue into sleep in your dreams. Here in this guide, we will be listing 5 of best gaming laptops for World of Warcraft. For playing a game like this on a laptop, you will need a decent machine with good specifications from a well-known manufacturer. We recommend purchasing a notebook with better specifications than official requirements since game developers release new expansions now and then and you will need a powerful laptop to handle most of their latest features. One should also be aware of the heating issues of a laptop because with games like WOW. You never know how long you will be playing and you don't want something that's almost burning on your lap. Another necessity is that your laptop has a decent display with at least 1080p resolution. If we look at the official requirements for WOW by Blizzard, then their minimum is Intel Core 2 Duo and Intel HD graphics 5000 but to be honest here, you won't be able to play smoothly on low settings with these kinds of specifications. However, their recommended specs are Intel Core i5 processor and NVIDIA GTX 750 Ti. Anyways, since you're here looking for our recommendation, we suggest you get a device with Intel Core i5 processor or better and the GPU should be NVIDIA GTX 960M or better. Blizzard releases a new patch every couple of months, and with these kinds of specifications, you won't have to worry for next 2 to 3 years. Memory also plays a crucial role when it comes to gaming and we suggest you get a laptop with at least 8 GB of RAM and the more is always better. Also to enjoy the game thoroughly, make sure your device remains cool, and we suggest you buy a decent cooling pad for your laptop. When it comes playing World of Warcraft, you will need a high-end gaming notebook such as ASUS ROG Zephyrus GX501. It's a pure gaming laptop that can easily handle games like WOW, Sims 4, League of Legends, and Minecraft. It features a 15.6-inch full HD display with 1920 x 1080 resolution and the G-Sync feature. The 144Hz refresh rate reduces motion blur and can provide a competitive gaming edge. The most common problem in almost all gaming laptops is the heating issue which it handles like a boss with its powerful cooling system named as ROG Active Aerodynamic System which increases airflow to keep the laptop cooler. Its hardware includes Intel Core i7-8750H processor, NVIDIA GTX 1080 GPU, 512 GB PCIe SSD, 16 GB DDR4 RAM, and 512GB SSD. On top of that, it has four Thunderbolt USB 3.0 ports and Gigabit Wave 2 Wi-Fi. I understand it costs too much for some WOW players and not everyone can spend $2000 for a gaming laptop, and if that's an issue then you can look for budget World of Warcraft laptops below, and we have sorted these machines by higher priced laptops to lower priced ones. Overall, it's a good looking PC with an amazing display and super high-end specifications that will deliver the performance as smooth as possible. This particular gaming laptop by MSI is yet another one of the best gaming laptops for playing World of Warcraft as well as other high-end games. When it comes to performance, it's ultra-fast and smooth. It comes with VR-ready feature and is one of the best gaming laptops under $1500. It has 32 GB of RAM as well which will help you boost the performance while playing WOW. Its other specifications include Intel Core i7-8750H processor, 128 GB SSD plus 1 TB HDD and NVIDIA GTX 1060 GPU. If you compare it with ASUS ROG Zephyrus GX501, both of them have almost same power but with this one, you can save around $600, and it will run games like WOW as smooth as its alternative. Its 15.6-inch full HD non-reflective display comes with 1920 x 1080 resolution at 120 Hz refresh rate and anti-glare treatment. It also has a full-color backlit keyboard. Many competitors of MSI including Alienware have tried to dupe its unique features, but none of them could do it and make their device available for a comparable price. This gaming beast by MSI is capable of handling all kinds of games and is a great option for professional gamers. 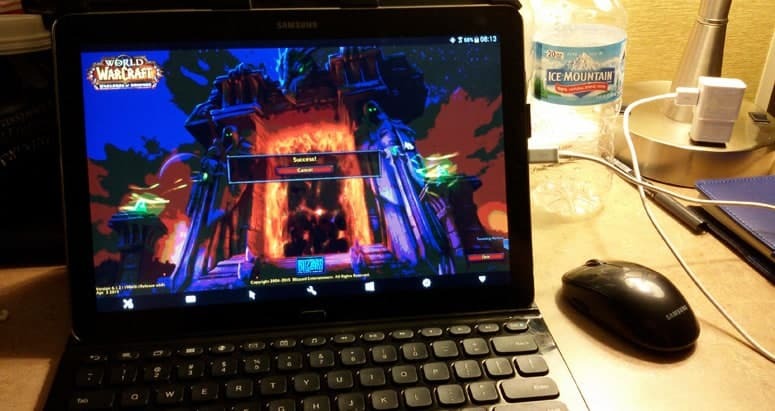 If you're looking for a gaming laptop to play World of Warcraft, then the ASUS ZenBook Pro might be a fantastic choice for gamers as well as college students. It can also be used to perform tasks like music production, graphics designing, video editing and DJing. Its internal hardware includes a 6th generation Intel Core i7-8750HK processor, 512 GB SSD, 8 16B of RAM, NVIDIA GTX 1050Ti GPU and Windows 10 Pro operating system. It comes with an amazing 15.6-inch UDH 4K display with 3840 by 2160 resolution and a nano-edge bevel. It's able to deliver the best performance while playing WOW and does exceptionally well while running large programs and multi-tasking. The Windows 10 Pro operating system means that the laptop is well-suited for everyday or business computing tasks as well as gaming. While many gaming laptops offer a poor battery life, the ASUS ZenBook Pro's 71Wh battery can last for around 9 hours while watching movies and videos on YouTube. This laptop is a perfect choice for gamers as well as businessmen due to its lightweight design and upgraded operating system, loud speakers, decent battery and powerful hardware. It can also be a good choice for travelers since it weighs in at only 4 lbs and is small enough to easily fit in most laptop backpacks. The Dell i7559-763BLK is a budget gaming laptop for WOW players, and it will cost you somewhere around $750, and of course, it’s among the best gaming laptops under $800. It features NVIDIA GeForce GTX 960M 4 GB GPU which is more than enough to run games like World of Warcraft and its 15-inch Full HD IPS display with a wide angle anti-glare feature is more than you can ask for. Its other insides include Intel Core i5-6300HQ processor, 256 GB SSD, and 8 GB DDR3L RAM. Most of the Dell gaming laptops are known to be extremely affordable, and they perform pretty well when it comes to games like Minecraft, Sims 4 and World of Warcraft. While buying it from Amazon, you also have an option to upgrade it with additional 8 GB RAM, and it'll cost you extra $50. You also have another option where you can ask for Razer Gaming Mouse for additional $80. It can also be used for your everyday tasks, watching movies, running heavy applications and of course gaming. Overall, this PC provides exceptionally great performance and loudspeakers as well making it a perfect choice for casual and professional gamers. If you're looking for an ultra-budget laptop for playing World of Warcraft, then this is exactly what you need. It's undoubtedly among the best gaming laptops under $800, and it comes with 8th generation Intel Core i5-8550U processor, 8 GB dual channel RAM, 256 GB SSD and NVIDIA GeForce MX150 GPU with 2 GB DDR5 VRAM. It's a very attractive laptop in 2019 and reason behind its popularity is its high-end specifications for a nominal price and of course its battery life of up to 15 hours. Another loved feature of this device is its backlit keyboard which is hard to find in this price range. This particular PC has over 800 positive reviews, and it can be used by almost everyone including everyday users, gamers, college students, graphic designers and video editors. It packs powerful hardware for a very reasonable price. It can also be great school graduation gift, and I gifted it to my niece last month. Overall, you will be impressed with its performance and its professional design. You now have a good understanding of what laptops are best for playing World of Warcraft and with laptops like these you can never go wrong. We have listed laptops for kinds of people, and these will cost you from $700 to $2000. You can decide which one you want according to your budget. Rest assured, anyone of these machines will be able to run games like WOW with ease. In case you have a big budget, you can also check our list of best high-performance laptops. Any laptop from that guide will be able to do whatever you'd like.